The University of Illinois Springfield will hold two commencement ceremonies on Saturday, May 13, 2017, at the Prairie Capital Convention Center, Ninth and Adams Streets in downtown Springfield. 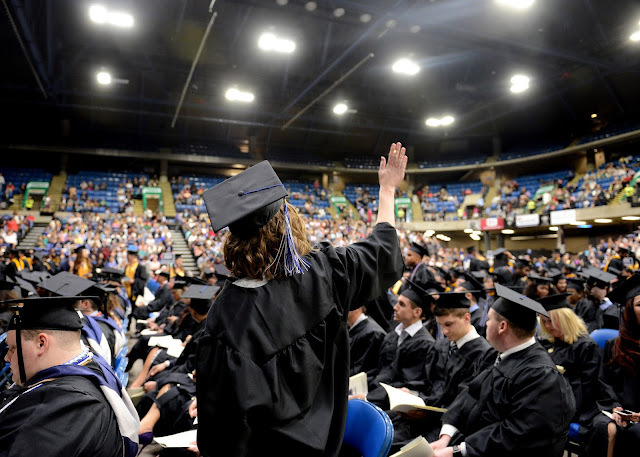 Of the 1,836 UIS students eligible to graduate, 1,270 will participate in the ceremony. The first ceremony for students in the College of Liberal Arts and Sciences will begin at 12:30 p.m. The second ceremony for students in the College of Business and Management, College of Education and Human Services and College of Public Affairs and Administration will start at 5:30 p.m.
Tickets are not required for admission and seating will be available on a first-come, first-served basis. There is no reserved seating, except for special needs such as interpretive services and wheelchairs. The doors to the main floor will open an hour before each ceremony. Overflow seating will be provided in the lower level of The Center. During the second ceremony at 5:30 p.m., Edgar J. Curtis, president and chief executive officer of Memorial Health System, will be honored with an honorary doctor of humane letters. Curtis was nominated by the UIS Department of Allied Health for his outstanding and innovative leadership in health care administration as well as his sustained and exceptional community service. Curtis has led Memorial Health System and its seven affiliates since January of 2008, providing senior-level administrative leadership for the overall strategic direction of the health system. Under his leadership, the health system’s annual revenue has grown from $500 million to $1 billion. In 2014, Memorial contributed $2 million and entered into a partnership with the University of Illinois Springfield and the University of Illinois Chicago College of Nursing to bring UIC’s Bachelor of Science in Nursing program to the UIS campus. In 2016, Memorial Medical Center was the only hospital in the nation, and the first in Illinois, to receive the American Hospital Association Quest for Quality award. Also in 2016, Memorial Medical Center received two of four Illinois Health and Hospital Association Quality Excellence Achievement Awards. Curtis serves on numerous healthcare boards and is currently chair of the Illinois Health and Hospital Association Board. He has served Springfield in leadership roles with several community organizations, including the Springfield Urban League, United Way of Central Illinois and Central Illinois Foodbank. Curtis received his masters of business administration degree from the University of Illinois at Urbana-Champaign and his bachelors of science degree in nursing from Southern Illinois University Edwardsville. He began his career as a registered nurse. Kristi Barnwell, assistant professor of history, has been chosen to serve as grand marshal. The student speaker will be Alexander William Camp, who will graduate with a master’s degree in public affairs reporting. Faculty and students in each academic program select one graduating student who best exemplifies the goals and spirit of that program to serve as student marshal for the ceremony. Accountancy: Deborah A. Stratton – B.A. (Peoria), Diane Marie Boyle – B.A., Binqian Shi – M.A. Biology: Jack Henry Zinnen – B.S., Jessica Michelle Souther – M.S. Biochemistry: Jarrett Matthew Lindsay – B.S. Chemistry: Carolyn D. Mazzuca – B.S. Clinical Laboratory Science: Lindsay Rajeanne Stevens – B.S. Communication: Laura Elise Troxel – B.A., Allyssa J. Brown – M.A. Computer Science: Alex C. Ginglen – B.S., Janasha Prabhu – M.S. Criminology and Criminal Justice: Kinsey Storm Weikel – B.A. Economics: Jocelyn A. Matsen – B.A. Education: Kari Lynn Caldwell – M.A. Educational Leadership: Christian Devon Mahone – M.A. Elementary Education: Makinzie J. Yoho – B.A. English: Alaina A. Beaird – B.A., Courtney E. Cox – M.A. Environmental Sciences: Timothy John Mayer – M.S. Environmental Studies: Lindsay Ann Frisk – B.A., Sydney Renee Rubenstein – M.A. Global Studies: Alexandra Nicole Madden – B.A. History: Kendra D. Baber – B.A., Kathryn M. Suits – M.A. Human Development Counseling: Alexa B. Kaufmann – M.A. Human Services: Kelly Ann Herd – M.A. Information Systems Security: Romillo K. Holloway – B.S. Legal Studies: Kaitlyn Aurora Murphy – B.A., Chevaughn Latoya Starling – M.A. Liberal and Integrative Studies: Pamela Jean Reed – M.A. Liberal Studies: Alisha Marie Funkhouser-Walker – B.A. Management Information Systems: Dale Gene Daily – B.S., Tara Stacy Sadler – M.S. Mathematical Sciences: Amanda Jean Gosbeth – B.A. Political Science: John C. Coultas – B.A., Dustin Baragiola – M.A. Psychology: Sara L. Stutzman – B.A. Public Administration: Terri Renae Miller – M.P.A. Public Affairs Reporting: Haley M. Bemiller – M.A. Public Health: Veenu Khubnani – M.P.H. Social Work: Sean N. Blackwell – B.S.W. Sociology/Anthropology: Rona A. Taylor – B.A. Visual Arts: Grace Katalinich – B.A. A number of events are planned for graduates, their families and guests, including a reception for Peoria-area students on Friday, April 28. Separate brunches for CAP Honors graduates and online degree graduates are scheduled for the morning of Saturday, May 13. Admission to some commencement events is by invitation only. Updated information, including a complete list of events, is available from the commencement website at www.uis.edu/commencement/. The ceremonies will be webcast live at www.uis.edu/technology/uislive/. DVD copies of the ceremonies can be purchased from the Office of Electronic Media for $25. Orders can be placed by phone at 217/206-6799 or at http://go.uis.edu/CommencementDVD. For more information, go to the UIS Commencement website at www.uis.edu/commencement/.